This post A Trained Monkey Can Predict Markets Better appeared first on Daily Reckoning. The first time I appeared on live financial television was August 15, 2007. It was a guest appearance on CNBC's Squawk Box program at the early stages of the 2007-2008 financial crisis. I've done 1,000 live TV interviews since then, but that first one remains memorable. Carl Quintanilla conducted the interview with some participation from Becky Quick, both of whom could not have been more welcoming. They and the studio crew made me feel right at home even though it was my first time in studio and my first time meeting them. Joe Kernan remained off-camera during my interview with his back turned reading the New York Post sports page, but that's Joe. We had plenty of interaction in my many interviews over the years that followed. Financial TV is one big prediction engine and the audience seems to have an insatiable appetite for it. That's natural. Humans and markets dislike uncertainty, and anyone who can shed some light on the future is bound to find an audience. No one expects perfection or anything close to it. 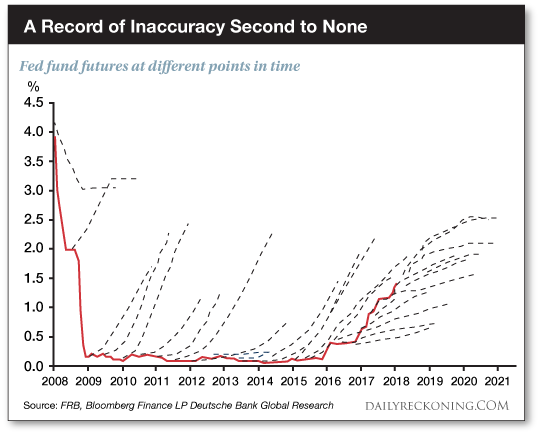 A forecaster who turns out to be accurate 70% of the time is way ahead of the crowd. In fact, if you can be accurate just 55% of the time, you're in a position to make money since you'll be right more than you're wrong. If you size your bets properly and cut losses, a 55% batting average will produce above average returns. Even monkeys can join in the game. If you're forecasting random binary outcomes (stocks up or down, rates high or low, etc. ), a trained monkey will have a 50% batting average. The reason is that the monkey knows nothing and just points to a random result. Random pointing with random outcomes over a sustained period will be ?right? half the time and ?wrong? half the time, for a 50% forecasting record. You won't make any money with that, but you won't lose any either. It's a push. Need proof? Every year, the Federal Reserve forecasts economic growth on a one-year forward basis. In 2010, they forecast 2011; in 2011 they forecast 2012, and so on. From 2009 to 2016, the Fed was wrong eight years in a row. When I say ?wrong? I mean by orders of magnitude. But, the Fed would forecast 3.5% growth and it would come in at 2.2%. That's not even close considering that growth is confined to plus or minus 4% in the vast majority of years. Let's not be too hard on the Fed. The IMF forecasts were just as bad. This forecast is not from a specific institution. Instead, it represents the ?wisdom of crowds? or the distilled views of all market participants as aggregated by market prices. As you can see, from 2009 ? 2015, the market consistently expected higher rates than the Fed delivered. Those are the black dotted lines above the red line. Right now, the market seems to have it about right, (the black dotted lines starting in 2018 and predicting higher rates), but we'll see what happens. My expectation is that the Fed is overtightening and will have to back off from rate hikes later this year. That means the red line will trend below the black dotted lines and the market will miss the mark again. The Fed Funds futures contract is one of the most liquid and heavily traded contracts in the world. If any futures contract reflects ?the wisdom of crowds,? this is it. What the results show is that ?the wisdom of crowds? does not have very high predictive value. It's just as faulty as the professional forecasts from the Fed and IMF. The classic case is guessing how many jellybeans are in a large jar. In that situation, the average of 1,000 guesses actually will be better than a single ?expert? opinion. That works because the number of jellybeans never changes. There's nothing dynamic about the problem. This is important because when academics say ?you can't beat the market,? my answer is the market indicators are usually wrong. When talking heads say, ?you can't beat the wisdom of crowds,? I just smile and explain what the wisdom of crowds actually does and does not mean. None of this means that polls, betting odds, and futures contracts have no value. They do. But, the value lies in understanding what they're actually indicating and not resting on a naive and superficial understanding of the wisdom of crowds. The problem with the ?experts? is not that they're dopes (they're not), or they're not trying hard (they are). The problem is that they use the wrong models. The smartest person in the world working as hard as possible will always be wrong if you use the wrong model. That why the IMF, Fed, and the wisdom of crowds bat below .500. They're using the wrong models. At Project Prophesy, I've got the right models, which I developed for the CIA working in collaboration with top applied mathematicians and physicists at places like the Los Alamos National Laboratory and the Applied Physics Laboratory. This is the methodology behind Project Prophesy, which allows my readers access to actionable recommendations they won't find elsewhere. The post A Trained Monkey Can Predict Markets Better appeared first on Daily Reckoning.